I gave up on making New Year’s Resolutions long ago. By the end of each year, I can’t even recall what my resolution was, let alone keep it. 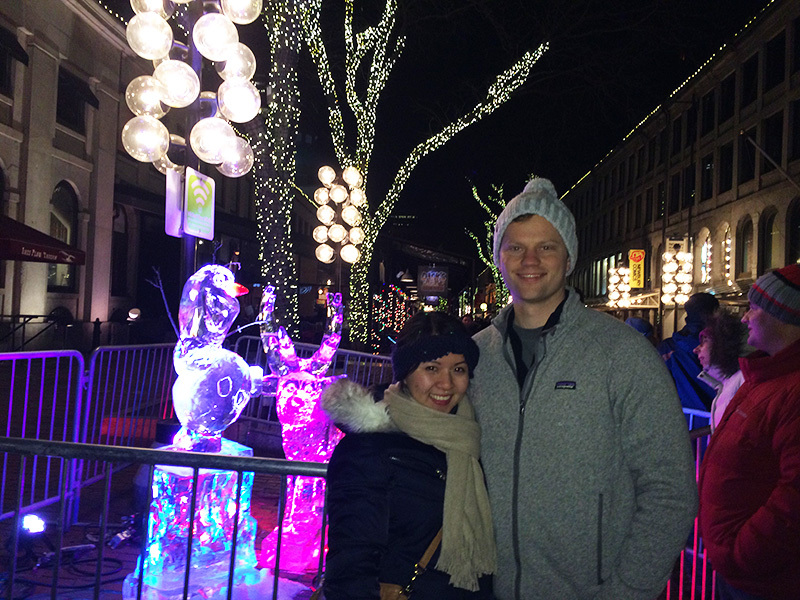 On New Year’s Eve, Karl and I spent the day roaming around Boston to participate in the First Night festivities. 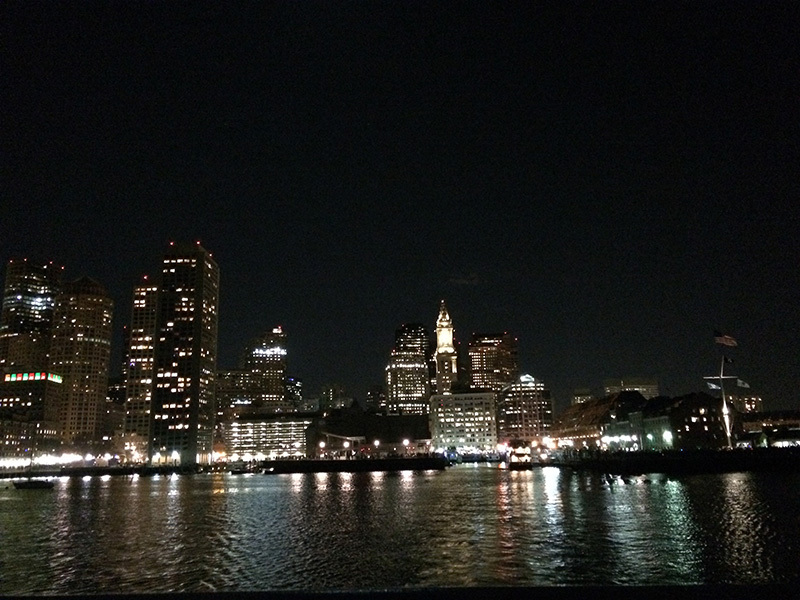 Our night ended with a harbor cruise to see the midnight fireworks. Having fallen asleep before the clock struck twelve last NYE, Karl and I wanted to make sure we did NYE justice this year. We were excited about this cruise because we knew we would have the best view of the fireworks. 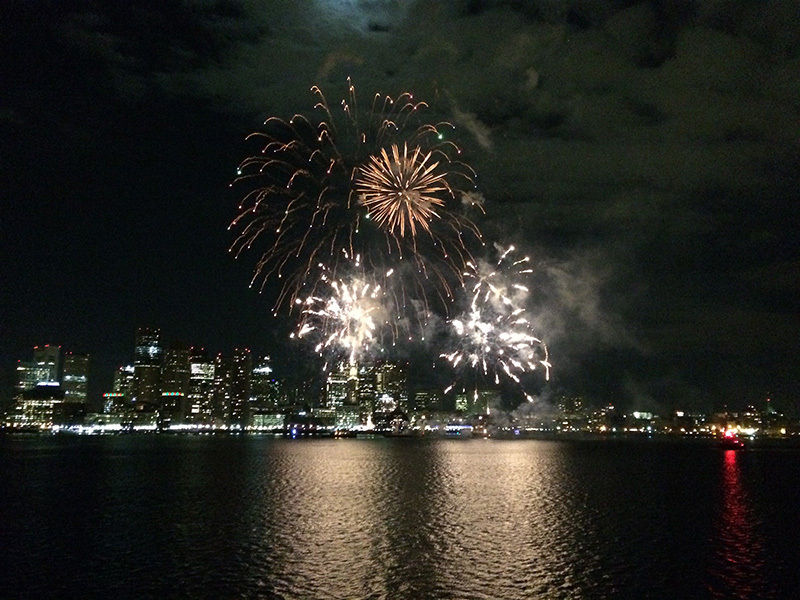 The view was spectacular, but it was hard to enjoy the fireworks with frozen toes. I got my view and my New Year’s kiss, so I can’t really complain. It was worth the few toes I lost to frostbite. Karl and I love indian food. It’s what we had for our first meal together way back when. A few months ago, I made chicken tikka masala for the first time at home, and it was absolutely perfect. I kept asking myself, “Why didn’t you do this sooner???”. Since that first time, I now make it fairly often because it’s just that good. It is always a big hit whenever I serve it to guests. Because indian food is so delicious and has such complex flavors, I thought it would be difficult to make it at home. The recipe, adapted from Alison Roman’s amazing recipe at Bon Appetit, is authentic and incredibly easy. All you need are the right spices. The rich and spicy sauce incorporates garlic, fresh ginger, various spices, and a tomato base. The chicken is marinated in a spicy yogurt sauce, then broiled in the oven for ten minutes. Allow it to simmer for some time (thankfully not for more than an hour), and soon the delicious aroma will fill your kitchen. Serve it with basmati rice, and that’s that. 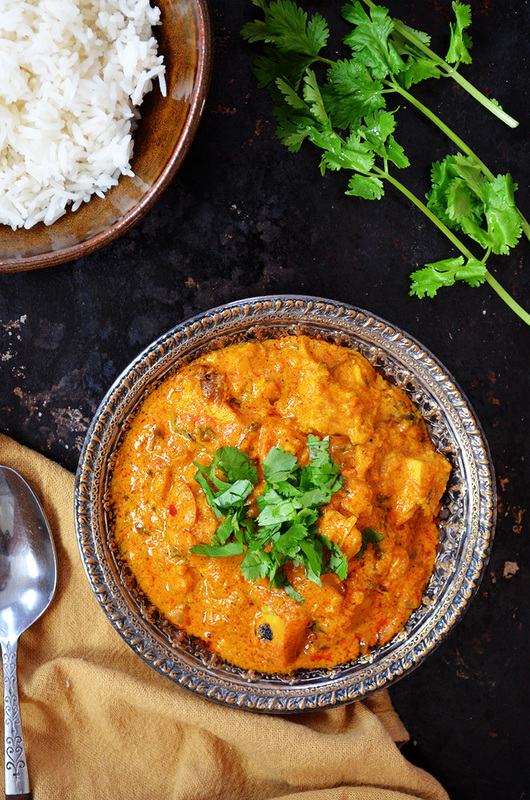 Wishing you all a wonderful new year and many servings of this chicken tikka masala! In a medium bowl, whisk yogurt, ½ tablespoon salt, and half of the spice mixture. Add chicken, coat it with the mixture, then cover with plastic wrap. Refrigerator for 1-4 hours (the longer the better). Cover the remaining spice mixture. In a dutch oven or large pot, heat the olive oil over medium heat. Add the onions, tomato paste, cardamom pods, and crushed red pepper flakes. Cook for about 5 minutes, until the tomato paste darkens and the onions soften. Add the remaining spice mixture, and cook for another 4 minutes. Add the tomatoes with its juices, carefully crushing them with your hands as you add them to the pot. Bring to a boil, then reduce the heat and simmer for about 8-10 minutes, until the sauce thickens. Add 1 teaspoon salt, cream and chopped cilantro. Simmer and stir occasionally for 35 minutes. Allow the chicken to cool down slightly, then slice into bite-size pieces. Add the chicken to the sauce, and cook for another 15 minutes. Serve with basmati rice, and garnish with more chopped cilantro (optional). This entry was posted in Entrees and tagged chicken, indian. Oh this looks so good! I also enjoy eating Indian food but don’t make it at home because the spice list often seems daunting. This tikka masala looks so good, Karl is a lucky guy! 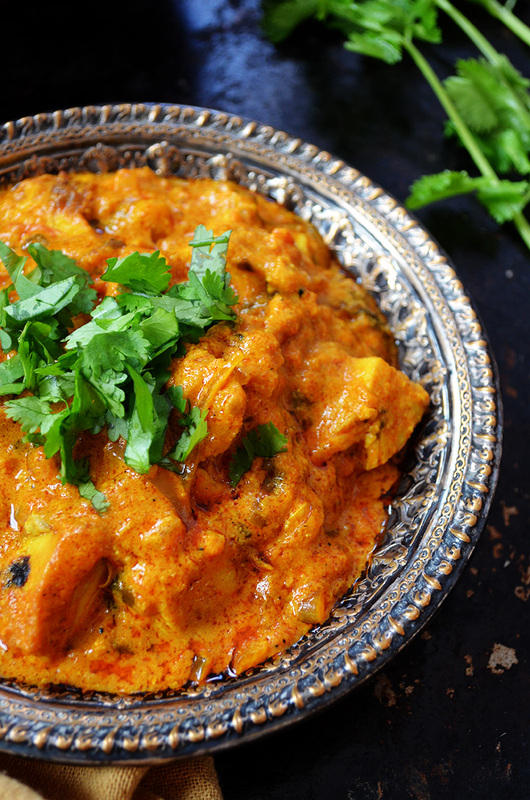 I’m going to go find some Indian spices next time I grocery shop – this yummy recipe has motivated me!